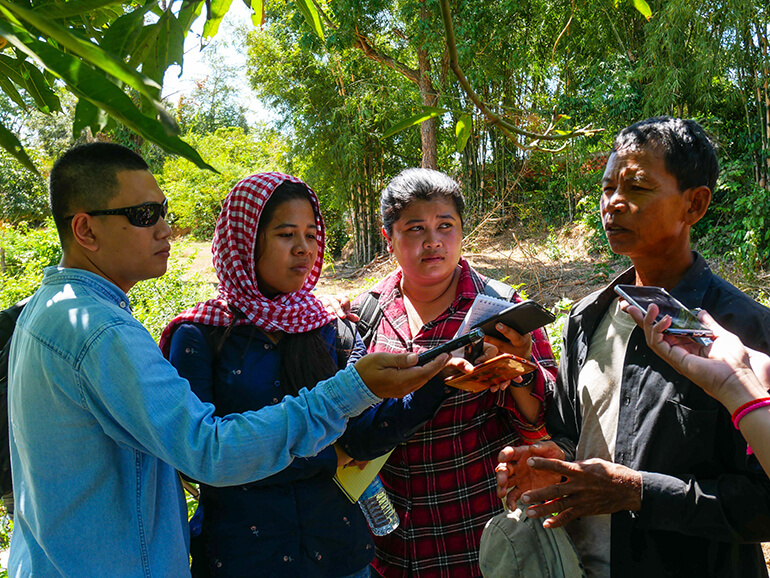 In November 2018, some fifteen Cambodian journalists met in Siem Reap for a week-long introduction to scientific journalism relating to agricultural topics. All types of journalist were represented: radio, television, pure players and the written press. “At the end of the week, I feel more confident at choosing angles, arousing the audience's interest and passing on messages, particularly to rural communities and farmers." Heng Vanny, radio FM 103, Siem Reap Working for private and public media outlets, based in Siem Reap and in Phnom Penh, and with varying levels of experience, they all had a shared interest in the rural world. The session gave them pointers on how to cover this subject in a different way, and helped to dispel some of their preconceptions. Led by Sylvie Larrière from ESJ Lille, (Lille School of Journalism), the workshop was organised in partnership with GRET, which imparted its knowledge of the subject and the rural areas to the participants. It was a week rich in educational opportunities for all the participants, who had the chance to join a regional forum on agroecology, and to visit the agricultural fair (featuring a great many exhibitors and domestic producers) and a number of farms close to Siem Reap. Alongside the theory classes, they had the opportunity to undertake a number of practical exercises and to meet a range of different players: agricultural engineers, scientists, NGO officials, project leaders and farmers. Field trips provided an opportunity to learn about innovative and thriving projects: agroecological vegetable production, growing crops on tables to reduce the impact of bad weather, etc. The journalists all committed to producing articles, video or audio reports in their respective media by the end of the year. A certificate accrediting their training will then be awarded to them. The topics selected include: the use of plants for cosmetics, the quality of produce obtained by organic farming, the truth behind fruit that is “too beautiful or perfect", new business models for farmers, etc. “I hope to produce more work in the future on topics relating to agriculture in the Siem Reap region, as it is a very significant sector which may contribute to the development of this still impoverished region. Our editor-in-chief also wants to cover stories relating to agritourism." “Having learned the basic principles of scientific journalism, I am going to cover more stories on agriculture. I have met a lot of the players involved (NGO officials, farmers, institutional actors, etc. ), who may serve as sources for other stories. Agriculture is an important topic in Cambodia, with major social and political implications for the country." “This session taught me how best to choose an angle, to write concisely and to understand the role of the journalist, who can convey information from farmers to consumers." “For me, this was a rare opportunity to go into the field. We have formed a closely-knit team with the other participants, despite our very different experiences and backgrounds. I have also learned a great deal from them. I can't wait to go back to my radio station, so I can share what I have learned with my colleagues."